This is the dramatic moment a driver came face-to-face with a wild elephant charging at his car. Chainunt Sorncharoen, 37, had just gone round a bend on a country road when he noticed the male jumbo in the road in Nakhon Nayok, central Thailand on Monday. 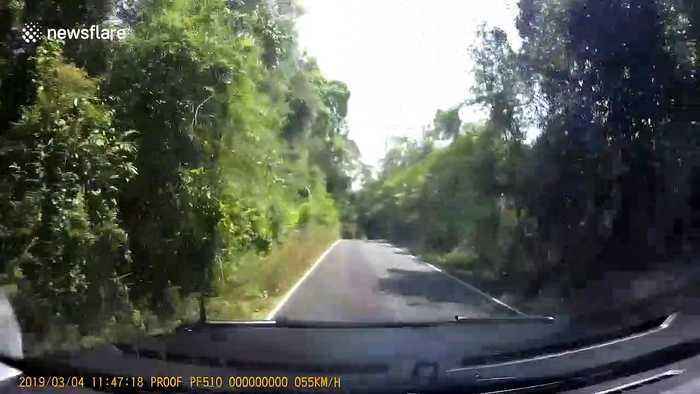 Dashcam footage shows how the driver had to suddenly brake when he saw the elephant walking towards him. He then reversed as quickly as he could when the elephant picked up its pace and started charging. Luckily, the elephant slowed its pace and stopped at the bush before losing interest and ambling back into the trees. A cyclist also had to stop and wait on the roadside after the elephant blocked the road. Chainunt said that he had seen wild elephants walking on the road before but this was the very first time he was chased by one of them. He was also concerned about the cyclist who parked the bike across the woods where the elephant stopped. 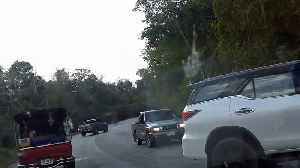 He said: “It was shocking to see him coming toward my car but I felt relieved when he stopped running. “I felt bad for the cyclist as I saw him standing still nearby the elephant, he must have been really freaked out. This is the terrifying moment a wild elephant raided a truck - leaving the passengers cowering in fear under their seats. Urawan Por-ammard and his family were on the way home when they spotted the..